Now that you have registered for a course—it’s time to go through the course as a student! This step is important for understanding the full user experience so that you can assist other users. Students can click the View Course button on the confirmation screen after the checkout process or access enrolled courses from the bottom of the Home page. 1. Click on View Course. This links to the course overview page to view the course outline, resources and progress. 2. Click on the Section 1 to get started or use Start Course or Continue Course button. NOTE: When viewing the course for the first time, the button will say Start Course. When continuing a course from a previous login, the button will display as Continue Course. Course content must be viewed in order before direct navigation links will work to skip around material. To mark the start of each section, there is a Section Preview page that contains an outline of the lessons and exams covered in the following section. This is a good place for students to take a break, if needed, before proceeding. 3. When you're ready to begin, click Start Section to view the first lesson. Navigating through the lessons is easy! One lesson is visible at a time. You will see the pages you added in the Lesson Editor on the left side of the page. 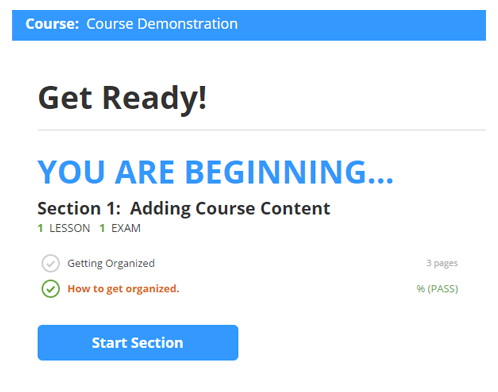 To navigate through the course pages, simply use the Next and Previous buttons or click on a Page Title in the left column to skip around within the lesson. Exam questions are listed on the left. Questions must be answered in order. Submitted answers cannot be edited. Students can exit during the exam and return to complete it at a later time. Once complete, the exam is scored. You may review the questions that you missed. If you have failed, click Retake Exam to try again. If you passed, click Continue to resume taking the course. NOTE: If this was the final exam on the course, clicking Continue will take you to view your final course grade, which is a simple average of all of your exam scores. If at any time a student leaves a course, then returns later to continue, the course overview will update with progress. 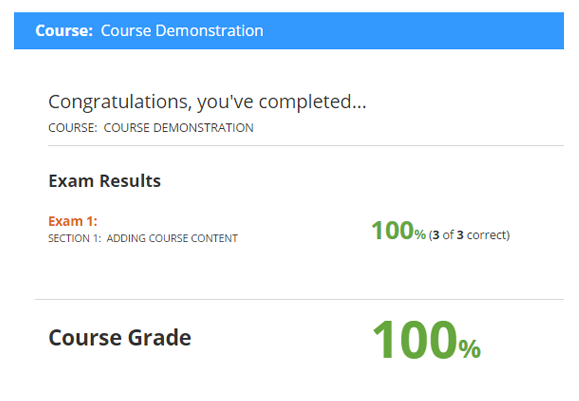 The Course Progress bar and percentage measures the student’s progress based on how many lesson pages and exams have been viewed or taken out of the total number available in the course. The Current Score is an average of the exam scores achieved this far into the course. 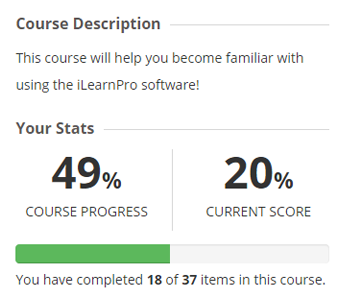 After completing a course by viewing all course content and passing all exams, iLearnPro will automatically calculate the course grade based on exam totals and open a notification screen. NOTE: The next time you view the course overview, your final grade will also be presented in the top right hand corner.